“The whole Renaissance is in this library.” This is how Frances A. Yates described John Dee’s library in her Theatre of the World (1969, p. 12). Others similarly claimed that his collection constituted the scientific academy of Renaissance England. With its 3000 to 4000 volumes, Dee’s library in Mortlake was indeed not only the largest library compiled in Elizabethan England but also the most comprehensive, representing virtually every aspect of classical, medieval and Renaissance learning. (Sherman, John Dee, p. 3) For a research project interested in early modern reading practices, this historical collection presents a uniquely rich repository of material on how a reader as prolific as Dee interacted with and manipulated his books. Neither Gabriel Harvey, on whom the first phase of AOR focused, nor John Dee considered the practice of reading an act of passively receiving information authoritatively given by the author of a book. Rather, reading was a process of surveying any given text for available information, of sifting and filtering the relevant from the irrelevant, and of digesting information and putting it to use, that required an active engagement with the written word. With this in mind, this essay explores the nature of the AOR corpus and situates it within the larger context of Dee’s library. One of the fundamental differences in examining Dee’s library as compared to the volumes annotated by Harvey is that much more is known about it as a collection. Dee catalogued his own books at numerous points in his life to prevent (or record) their loss, and while he was ultimately unsuccessful at preventing the dispersal of his library, his catalogue of 1583 has attracted the attention of generations of scholars. Thanks to the efforts of Julian Roberts and Andrew G. Watson, its facsimile was reproduced in 1990, and an online edition is under constant revision by the Bibliographical Society. Beyond the bibliographical interest, historians concerned with the history of reading have begun exploring Dee’s library, too. Drawing on its holdings and the ways in which Dee used and interacted with his books, William H. Sherman has challenged Yates’ depiction of Dee as a solitary reader, arguing that as a court advisor he entertained a great network of leading intellectuals and powerful courtiers. In this respect Dee was similar to Gabriel Harvey, who likewise did not exist in splendid isolation, but who lent his books to friends and colleagues and studied books together with members of the social elite, as Lisa Jardine and Anthony Grafton have so vividly shown. (Grafton and Jardine 1990) Still, in spite of these and other points of overlap, the ways in which these Renaissance readers put their libraries to use might have differed greatly, in part due the different trajectories in which their careers and lives moved. The second phase of AOR places twenty-three of John Dee’s books alongside the fourteen Harvey books already in the digital research environment. This has enabled comparative research aimed at addressing the larger questions of how renaissance readers like Dee and Harvey read their libraries. The process of selecting the books which comprise the AOR Dee corpus differed from the composition of the AOR Harvey corpus. The main difference lies in the fact that whereas the main body of the Harvey corpus consists of the eight (and later nine after Princeton acquired Harvey’s annotated Tusser at auction in December 2015) books in the holdings of Princeton University Library, the Dee corpus was based on a broader selection of available books from other libraries. It goes without saying that in the composition of both corpora we had to take into account various factors such as the availability of books and the price charged by the various institutions for their digitization. In order to limit the cost of digitization, we decided to digitize only the books that were owned by Dee or Harvey in cases where they were subsequently bound together with other books (e.g. Pantheus’ Voarchadumia). Like the Harvey corpus, the books of the Dee corpus are drawn from from various repositories, with one exception all located within the United Kingdom. The proximity of the Royal College of Physicians (RCP), whose collections boast the largest number of surviving Dee books, and the UCL campus, spurred the close cooperation between these institutions and made it possible to include fourteen of Dee’s books owned by RCP in our corpus (representing approximately 14% of RCP’s holdings). In addition to the familiar constraints of money and time, the sheer number of extant Dee books posed another challenge and forced the AOR team to make some tough choices about which books to include and exclude. Ultimately, the composition of the Dee corpus of annotated books is based on a threefold rationale. Firstly, we selected books that comprised types and styles of reader interventions that are not represented in the Harvey corpus. Because of its vastness and the manifold ways of physically and intellectually interacting with texts, Dee’s library provides enlightening insight into early modern reading practices. In addition to the various forms of annotations Harvey deployed in his books, Dee’s corpus contains a number of new interventions, including the use of additional symbols, genealogical trees, complex astrological charts, dense tables, and expansive drawings. The most intrusive example of Dee’s intervention is the physical manipulation of Pantheus’s Voarchadumia. Dee interleaved his copy with blank pages, creating the space needed for a juxtaposition with De re metallica, another of Pantheus’s treatises. Interestingly, later readers also physically manipulated Dee’s books. For example, twentieth-century librarians inserted notes on separate slips of paper into his copy of Maternus’ Astronomicon. (These notes are now kept with the book, but in a separate envelope, in order to preserve them.) These types of reader interventions, and their visual nature in particular, represented a possibility to widen the range of interactions of readers with their books covered in AOR, but also provided an opportunity to enhance the technical capabilities of the AOR resource. Secondly, to reflect the variety of reading and annotation strategies the AOR Dee corpus also includes lightly annotated books such as Euclid’s Elementorum libri XV, as well as different book formats, ranging from Cicero’s Opera in folio to Gerhard Dorn’s Chymisticum artificium in octavo. Neither Harvey nor Dee annotated every book they read extensively: only including the densely annotated books, as tempting as it might be, would create a lopsided and misleading image of early modern reading practices. In some instances, the annotations are unfortunately rendered illegible or are even lost. From contemporary descriptions of his library, we know that Dee left many of his books unbound. (Sherman, John Dee, pp. 31-32) As these were bound at a later date, some annotations either disappeared in the gutter of tightly bound books or were destroyed when the leaves were cut. Our investigations of early modern reading practices are thus shaped not only by the actions of early modern readers, but by the interventions of later book-sellers, librarians, and collectors as well. Lastly, in relation to Dee’s library as a whole the books including in the Dee corpus were selected to reflect the different intellectual interests which Dee pursued throughout his life, including mathematics, astrology/astronomy, medieval history, and New World discovery. Moreover, while a number of books in the Dee corpus are more technical in nature and cover subjects not represented in the Harvey corpus, at the same time we aimed to spur comparative research through the selection of imprints which have a thematic overlap with items in the Harvey corpus. Hence, for example, the inclusion of classical texts such as Cicero’s Opera and Quintilian’s Institutionum Oratoriarum. In part due to earlier decisions we made when composing the Harvey corpus, including books that both Dee and Harvey read and annotated, such as Quintilian’s Institutionum Oratoriarum, Josias Simmler’s epitome of Conrad Gessner’s Bibliotheca, and Jacobus de Saa’s De navigatione, unfortunately was not possible. While the composition of the Dee corpus allowed us to include strands of knowledge that were not represented in the Harvey corpus, it proved impossible to represent all the intellectual interests of both readers in the carefully curated corpora presented in the AOR digital research environment. For example, both Dee and Harvey were avid readers of medical texts and their libraries included books such as Gualterus Bruele’s Praxis medicinae theorica, Hieronymus von Braunchschweig’s Apothecarye (both owned by Harvey), Giovanni Marinello’s Le medicine partenenti alle infermità delle donne and Antoine Mizauld’s Planetologia. Of the latter two books, which formed part of Dee’s library, only Mizauld’s work has been included in the AOR corpus. As a result, the subject of (astronomical) medicine has been represented only to a very limited degree. Still, marginal annotations which pertain to medicine can be found in books which are not of a medical nature, such as the interest in gout Harvey pursued in his copies of Melanchthon’s Selectarum declamationum and Olaus Magnus’ Historia de gentibus. Ultimately, the composition of the two AOR corpora has been an act of balance and reflects the attempt to cover a representative selection of the Dee’s and Harvey’s intellectual interests and the ways in which they interacted with their books. Aiming to cover all the interests a reader pursued would have led to a very fragmented corpus, obfuscating the links established between individual imprints and the existence of thematic clusters of books within libraries created by readers as they read their libraries. As will have become clear by now, we also decided to focus on a particular medium of information, namely printed books, leaving out the manuscripts owned by both Dee and Harvey. Aside from the gaps every selection is bound to leave, the wide array of Dee’s academic pursuits is somewhat encompassed, covering his nautical interest with De navigatione tres libri by Jacobus a Saa and his occupation with languages with De originibus by Guillaume Postel. Reflective of Dee’s greatest interests, three thematic groups stand out. They show a clear chronological development made evident by Dee’s practice of marking what appears to be the date of acquisition on the title page of each volume. The first thematic group contains the earliest dated book included in the AOR corpus. It is a copy of Quintilian’s Institutionum oratoriarum libri duodecim, which is dated to 1545. A rhetoric manual commonly used during the Renaissance, this volume bears witness to the humanistic study in which Dee had immersed himself. (Sherman, John Dee, 20-21) Still at Cambridge, he also acquired a copy of Ovid’s Ars amatoria in 1546. The greatest testament to his keen studies of Latin and classical rhetoric are his densely annotated volumes of Cicero’s monumental Opera (II/0565), which also bear dated inscriptions from 1546. Here one of the key strategies of scholarly reading exercised during the sixteenth century is clearly visible. In the margin of the text Dee indefatigably collected thesauri of useful phrases, images and ideas, an indication of the great scrutiny with which Dee had read the volumes. The dated annotations scattered throughout the volumes furthermore tell us that Dee was working on the two volumes for an extended period of time, even when travelling to Paris. The second thematic group encapsulates Dee’s increasing interest in astronomy and astrology. After lecturing on Euclid at the Rhemes College in Paris, Dee returned to England in 1551, where he soon became one of the foremost court intellectuals due to his astrological expertise. The AOR corpus accounts for this discipline with four volumes, all of which entered Dee’s library before Elizabeth I ascended the throne. In the case of Maternus’s Astronomicon libri VIII we even know that Dee obtained this volume on his stay in Louvain during the winter of 1550/51. (Roberts & Watson, Catalogue, p. 75) On the frontispiece of this volume Dee noted ‘Louvani’ right next to the year 1550. After meeting Girolamo Cardano at Southwark either in 1552 or the year after, Dee acquired the former’s Libelli quinque in 1553, the same year to which his volume of Antoine Mizauld’s Planetologia is dated. (Roberts & Watson, Catalogue, p. 75) In the early 1550s, Dee also acquired a copy of Andreas Alexander’s Mathemalogium prime partis. What is remarkable about this volume is that Dee noted not only its date of acquisition, that is, 1551, but also when he studied the book. Under the body of the text, Dee jotted down that he had read the entire book between 18 and 24 September 1555 (093). 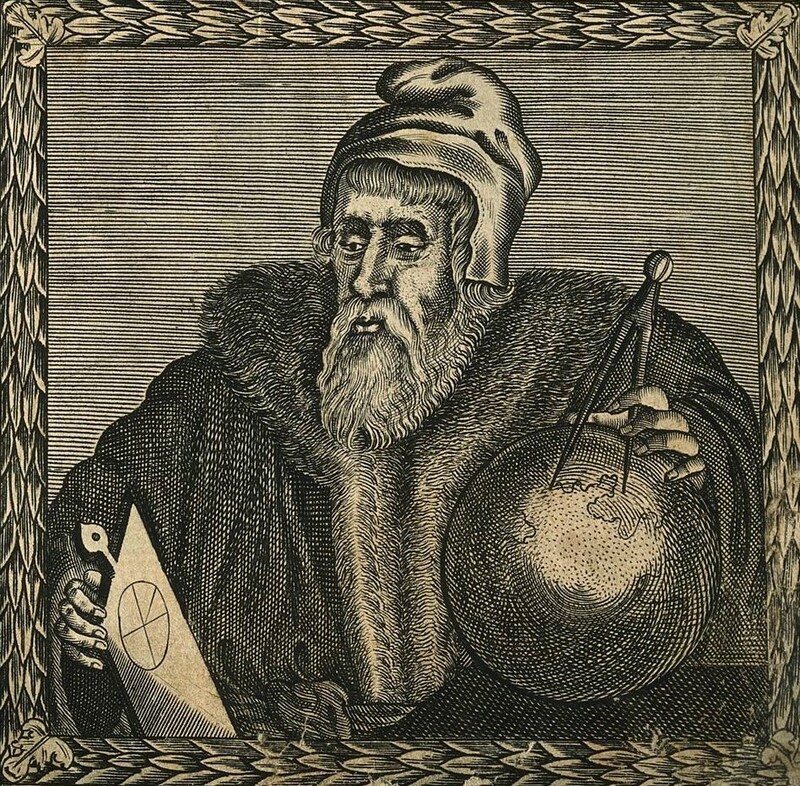 A later addition to the thematic field of astrology is the Doctrina revolutionis solis by Paulus Crusius, a volume which entered Dee’s library in 1568. The discipline most prominent in the AOR corpus of is that of history. However, by the time that Dee acquired these particular books, he no longer took note of doing so, leaving us with no evidence other than the volumes’ publication during the 1570s. Given that Dee’s interest in history arose from his obligation to provide historical arguments to legally claim the possession of foreign lands by Elizabeth I, it can be assumed that Dee obtained and studied these volumes at the height of the English expansion in the last quarter of the sixteenth century. This purpose of study is also suggested by the fact that the volumes included in the AOR corpus mainly deal with English history. Besides the Historia brevis and Ypodigma Neustriae vel Normanniae by Thomas Walsingham, Dee’s collection encompassed Geoffrey of Monmouth’s Britanniae vtriusque regum et principum origo et gesta insignia and Matthew Paris’ Flores historiarum. Beyond the confines of the British Isles, the AOR corpus also contains works concerned with history more generally like Matthieu Beroald’s Chronicon, while Fernando Colón’s biography of his father Christopher Columbus, the Historie del S. D. Fernando Colombo, represent Dee’s keen interest in New World discovery. In addition to the thematic progression, the chronological approach also brings to the fore a development in Dee’s annotation style. The works annotated at an earlier stage in his career show a neater hand and reveal a less intrusive way of annotating the books, characterized by structural notes and thesauri of key phrases and words gathered from the text. The volumes also give a more human glimpse of the young Dee, who, letting his mind wander, scribbled doodles in the margins, especially in Cicero’s Opera. Certainly the most elaborate of his drawings is that of a ship in the right hand corner of Cicero’s De natura deorum (II/771). As Dee grew more mature as a scholar, so did his annotations, too. This is particularly evident in the transition from his humanistic studies to his astrological pursuits. His volume of Cardano’s Libelli quinque shows a number of interventions that either correct or expand what is printed (135), something rarely found in Cicero’s Opera. Dee’s great erudition is furthermore testified in the many references which he made in the marginal annotations of his historical works. However closely the AOR corpus follows the development of Dee’s intellectual pursuits, this select corpus is determined first and foremost by the academic interests and personal preferences of the scholars concerned with it (and also by those of our colleagues and the wider field). The disciplines singled out are a result both of decades of scholarship on John Dee and of the response to and understanding of this scholarship by the AOR team. In this, it has a clear connection to the selection of the Harvey Corpus, which took the scholarship on his annotated copy of Livy as a point of departure for further investigation. The Dee corpus is neither a collection of the most important or precious books in Dee’s library, nor a compilation of those dearest to their collector. Rather, their selection was guided by the preponderant interest in reflecting the breadth of different annotation styles Dee employed. Yet we must not deny that the scope of the corpus is relatively limited both in terms of Dee’s wide-ranging interests and in its reflection of the way in which Dee approached his books. Most certainly, there are many more annotations hidden in the mass of volumes we know to have been in his possession. At the same time, it is worth acknowledging that annotations were only one of the many tools with which Dee ‘read’ his books. Of similar importance were the physical arrangement of his library, its thematic classification and its overall structure. All these are techniques, one may claim, which form part of Dee’s reading practice. Since Dee’s death and the dispersal of his library, all of the above are lost, however. The most tangible evidence of his reading practice remains therefore the interventions Dee made in his books. Their digitisation opens up a whole new world to its users, allowing for a unique insight into the way in which Dee read his books and interacted with the information contained in them.